The world's largest collection of the world's smallest flowering plants. Duckweeds (Lemnaceae), the fastest growing angiosperms, are increasingly gaining attention as potential crop plants for production of biomass. The availability of genome sequence data and effective techniques for genetic transformation in this plant family attracts researchers to reconsider their lost legacy as model plants. The January 2015 Plant Biology Special Issue presents interesting papers about duckweed systematics, physiology, molecular biology, biotechnology and heavy metal toxicity and is dedicated to late Elias Landolt (1926-2013), the “father” of modern duckweed research. The International Steering Committee on Duckweed Research and Application (ISCDRA) was formed in August 2013 to guide the work of the duckweed community until the next major conference in 2015. Read the latest news below. Announcing the order fee was adjusted, $100/strain (academic), $150/strain (non-academic), effective on Jan 1, 2019. See FAQS for details. Duckweed is a family of aquatic plants that float on the surface of lakes and waterways worldwide. It grows in a variety of climates from Siberia to the tropics. Five genera of duckweed, including 37 species, have been identified. The Wolffia genus contains the smallest known flowering plants on earth. Representative species from the 5 genera of duckweed. Click image to enlarge. As its name implies, duckweed is eaten by ducks—as well as other animals—and behaves much like a weed: it multiplies rapidly, especially on water rich with nutrients such as nitrogen and phosphate. Farming duckweed. Rutgers PhD student Philomena Chu sets up floating barriers to contain duckweed grown on a horticultural runoff pond in Columbus, NJ. What is the true number of duckweed species? This recurring question has come up in discussions with colleagues and students. The two numbers that have been quoted are 38 and 37. After a recent discussion with Klaus Appenroth, it is confirmed that it should be 37. 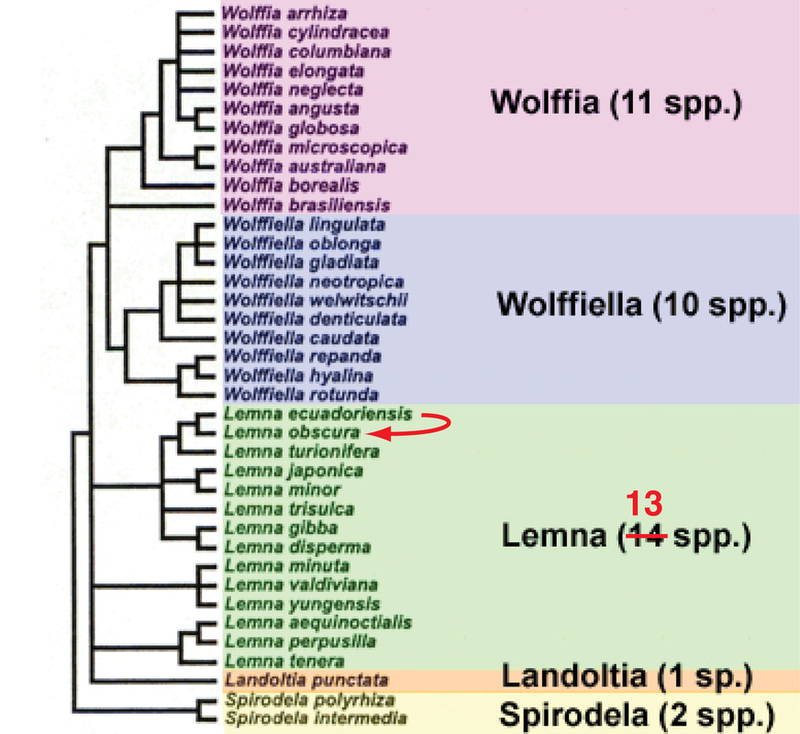 Although a paper in 2002 from Don Les' group listed 38 species, Lemna ecuadoriensis was combined with Lemna obscura by Elias Landolt. This was subsequently supported by the recent AFLP analysis results from the Appenroth lab (Planta 2010) where 84 clones of Lemna were compared. I hope this comment will help to lessen the confusion in the field and stimulate additional discussions if necessary. 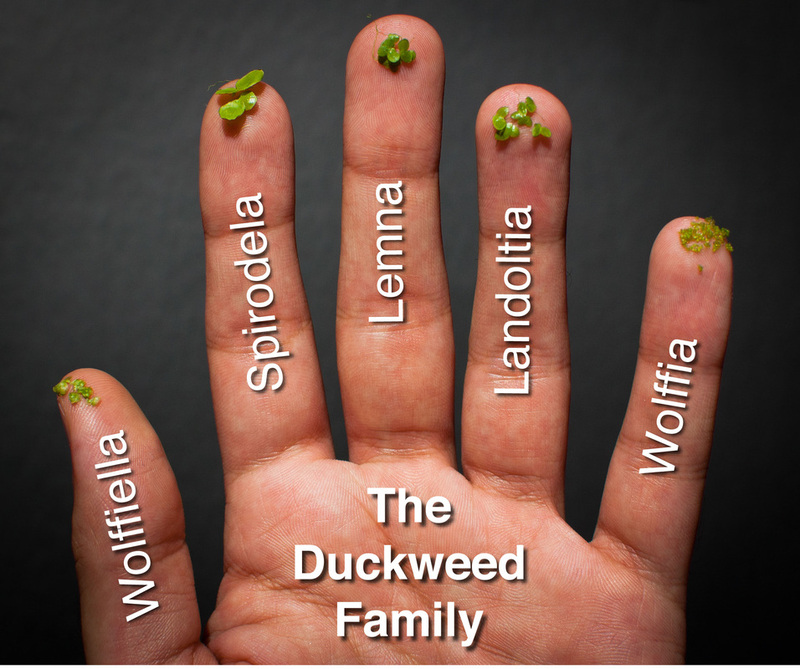 (Right) Phylogeny of the duckweed family. Original image by Wayne Armstrong. Click image to enlarge. Spirodela polyrhiza grown on filtered wastewater from Princeton Meadows Wastewater Treatment Plant. This strain (# 9316) was originally collected from a lake in Ajmer, India. Duckweed is one of the fastest growing plants on earth. It uses asexual reproduction to multiply rapidly on nutrient-rich water. In the process, it absorbs the dissolved nutrients and purifies the water. Photography by Ryan Gutierrez and Philomena Chu, Laboratory of Eric Lam, Department of Plant Biology and Pathology, Rutgers, The State University of New Jersey.